Here is a compilation of posts from Online Community Strategist that deal specifically with the intricacies of community management. If you’re new to this blog, please read through any that pique your interest. 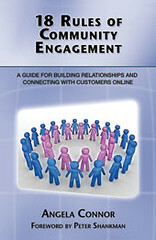 You may also consider my book, 18 Rules of Community Engagement. See the website and media kit for details. Have you complimented a user today? How do you handle deaths in your community? Engaging users at all costs: How much is too much?